This interesting and unusal surname is of Anglo-Saxon origin and is a locational name from Haversham in Buckinghamshire. The place name was recorded as "Haefaeresham" in the Domesday Book of 1086, and derives from the Olde English pre 7th century personal name "Haefer", which is a nickname from "haefer", he-goat, with "ham", village, estate, manor, homestead; hence "Haefer's homestead". During the Middle Ages when migration for the purpose of job-seeking was becoming more common, people often took their former village name as a means of identification, thus resulting in a wide dispersal of the name. 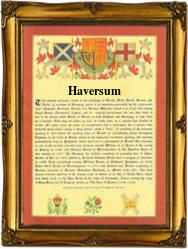 The surname is first recorded in the late 12th century (see below) and can also be found as Haverson. Nicholas de Haversam is noted in the Hundred Rolls of Buckinghamshire (1279). Recordings of the surname from English Church Registers include: the christening of Margaret, daughter of William and Margaret Haverson, on June 17th 1694 at St. Mary Whitechapel, Stepney, London; and the marriage of Sarah Haverson and James Scott on October 3rd 1717 at Heacham, Norfolk. The Coat of Arms; most associated with the family is a blue shield with a silver fesse between six silver crosses pattee, the crest being on a gold ducal coronet a black mullet. The first recorded spelling of the family name is shown to be that of Hugo de Hauersham, which was dated 1190, in the "Pipe Rolls of Bedfordshire", during the reign of King Richard 1, known as "The Lionheart", 1189 - 1199. Surnames became necessary when governments introduced personal taxation. In England this was known as Poll Tax. Throughout the centuries, surnames in every country have continued to "develop" often leading to astonishing variants of the original spelling.